Leland is Smart Bottoms first ever Limited Edition print. There have been retailer and event exclusives a plenty, but Leland is Smart Bottoms first Limited Edition print and Diaper Junction will be one of only a few retailers who will be stocking this print int he popular 3.1 style on January 27, 2017 at approximately 12:01 am EST and 10am EST. Our Leland 3.1 stock is extremely limited so we would like to encourage you to join our NO-OBLIGATION waiting list. Waiting List subscribers will receive an instant email notification the moment our Leland 3.1 inventory stocks and is available for purchase. 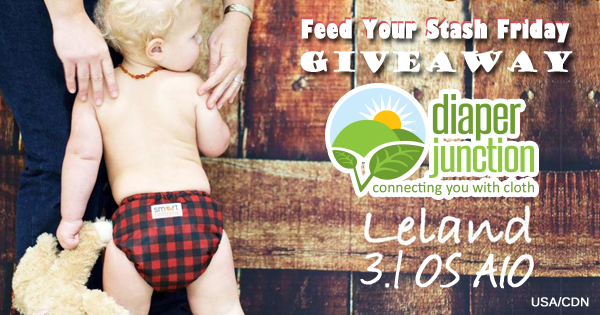 Enter to win a Leland 3.1 Diaper by using the Rafflecopter form embedded below. This contest is open to the USA & Canada. Winner's entries will be verified and winner will be notified by email. Winner has 7 days to reply and claim their prize. This is the best giveaway!!!! Need this print for our boy seeing how daddy owns a large firewood and logging business in Hampton Roads. This print is right up lumber jack alley. Love it. That's the best giveaway! Well done diaper junction!! What an awesome giveaway! I can't wait to have this print!! Beautiful print! I'd love to try Smart Bottoms diaps!